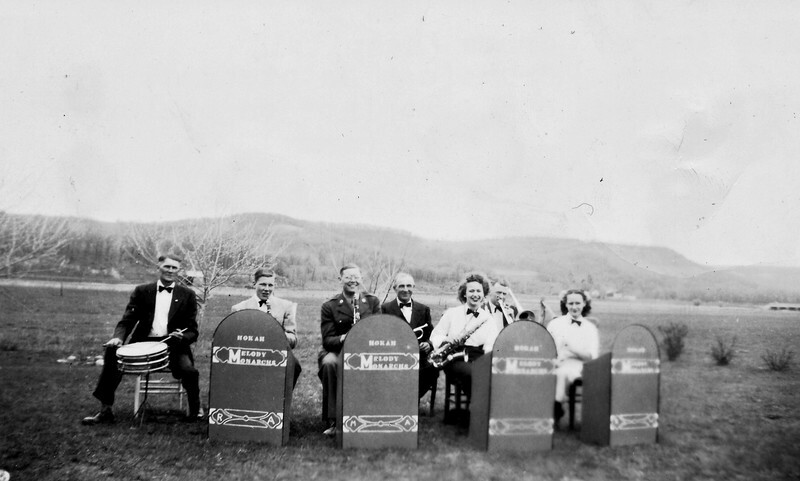 Caption on back of picture: Ruben Amsrud - drums (hospital), Vic Langen - drums )not in picture), Morrie Amsrud, clarinet (not in picture), Harold Amsrud, clarinet, Le Vonne Walker, saxaphone, Rudy Walcker, thrombone, Joe Von Arx, cornet, Rudy Langen, cornet (not in picture, and Irene Von Arx, piano. -----Joe Von Arx 4th from left and Irene Von Arx on the end on the right. Irene also played clarinet.